We are in business of replacement Spares Parts suitable for Air-cooled and Water-cooled Air/Gas Compressors mfg by OEM Ingersoll-Rand , Dresser-Rand , Kirloskar & C.P.T. 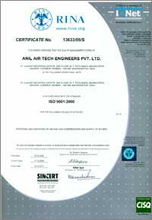 We also cater Technical Consultation, Servicing, Overhauling, Fabrication Of Air Pipe Lines etc globally. Our products and services are accepted globally due to the quality OEM Specification, Dimensions, MOC, reliability & guarantee which saves loss of productions & down time of unit. We keep most of the spares in adequate quantity, so as to make them available ready stock for immediate shipment. 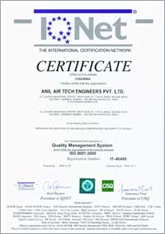 We are ISO 9001-2000 company certified by Certifying body RINA & IQNET since year 2005. Deonar - Chembur, Mumbai - 400 088, Maharashtra, India.